Once upon a time there were two sisters. One was named Jane and the other Melissa. Jane and Melissa were raised by two hardworking, frugal minded parents. These wonderful parents raised the sisters to understand the importance of saving money, spending wisely, and budgeting. Jane and Melissa both began receiving an allowance at age 12. They were both given the same amount of money and were taught to save at least 10%, tithe 10% and the rest they could spend. Melissa began babysitting at a young age. The majority of her weekends and summers were spent babysitting for multiple families. She was able to earn a good deal of money from this job and she followed her parents counsel by saving and tithing 10% of her income. As Melissa grew, so did her social life. She loved to spend her weekends with friends. She enjoyed using her spending money, and because she had saved and tithed, she felt no guilt in spending the rest. Melissa and her friends spent the majority of their time together going to movies, eating out at restaurants, and shopping at the mall. At age 16 Melissa got a job. This job provided her with part time hours during the school year and full time during the summer. She was earning more money now, and was diligent about saving money and preparing for her financial future. Melissa was very proud of her bank account, and proud that she had been able to save faithfully during her teen years. When she graduated from high school she had $3,000 in her savings account. Unlike Melissa, Jane didn’t babysit very much during her younger years. She tried to do extra chores around home and was able to earn some extra money that way. At age 16 Jane began working at the same store Melissa had worked at. Jane was also able to earn a steady income with part time hours during the school year and full time during the summer. Jane worked hard at her high school job and enjoyed earning money. She was diligent about tithing 10% of her paychecks, but decided to save even more than the 10% her parents had asked of her. Instead, she saved 70% or more of each paycheck and kept very little for personal spending money. Her social life grew, as most teens did. She chose her friends wisely, and found friends who had similar goals and aspirations as she did. Instead of going to movies and shopping, like Melissa and her friends did, they instead chose to spend time at each other homes and enjoying frugal activities together. Jane graduated from high school with $16,000 in her banking account. Two Sisters. Raised the exact same way. Given the exact same allowance. Worked at the exact same job, received the exact same paychecks. Yet, Jane ended up with four times the amount of money that Melissa had. Jane was much wiser in her spending. She chose to participate in frugal activities and understood the value in saving as much money as she could. Melissa on the other hand did the bare minimum. She didn’t worry much about the future, and figured as long as she was saving a little bit, she would be fine. Melissa didn’t realize the life she COULD have given herself if she had only practiced a little more self control. Her vision was not as big as Janes. All good stories end with a moral, and this one is no different. 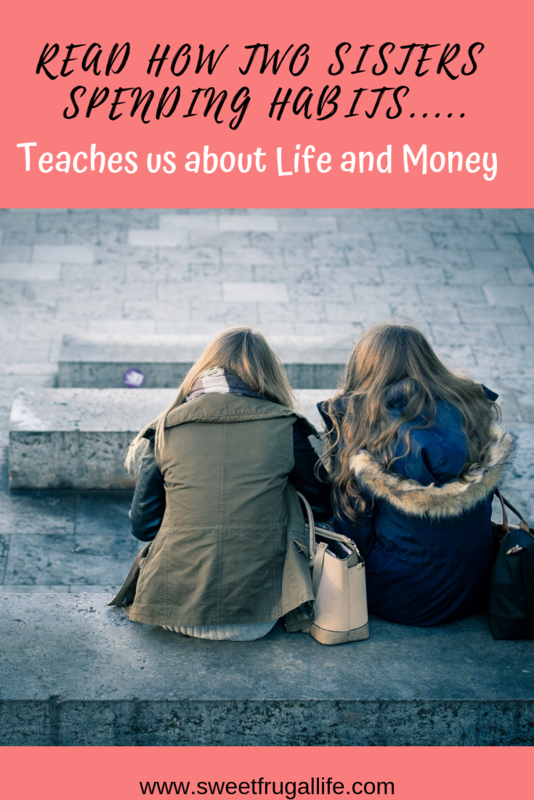 The story of Jane and Melissa has taught me many many financial lessons. However, there is one lesson that sticks out to me more than the others. Jane and Melissa received the EXACT same paychecks, for the EXACT same number of years. Their parents taught them the EXACT same money principles in the EXACT same way. But, Jane chose to save and save and save, while Melissa chose to spend. This teaches me that our financial situation is not always about how much money we might MAKE….it is more about how much money we SAVE. The paycheck isn’t the problem, our spending habits is the problem. It is easy to use a low paycheck as an excuse for not being able to save money….but I believe we could all spend a little wiser and live a little more frugally, if we are willing to make those changes. I am able to say this, because this is MY story. I am Melissa. Thank you for sharing your real life story. Glad to see you were taught to tithe to the church. Lesson learned and hope your saving has grown since. It definitely has! I have learned many lessons! This is a great lesson to teach! this sounds like me and my sister lol. I also think it varies as I’m the oldest and had to deal with a lot of responsibilities. My sister was the middle and the wild child lol. Thanks for sharing this!